Select the questionnaire in which you want to add/update automatic reminders. Go to Status Actions tab. Three different actions can occur when an invitation is marked as Reviewed in the invites module. You can use one, two, or all of the status actions. 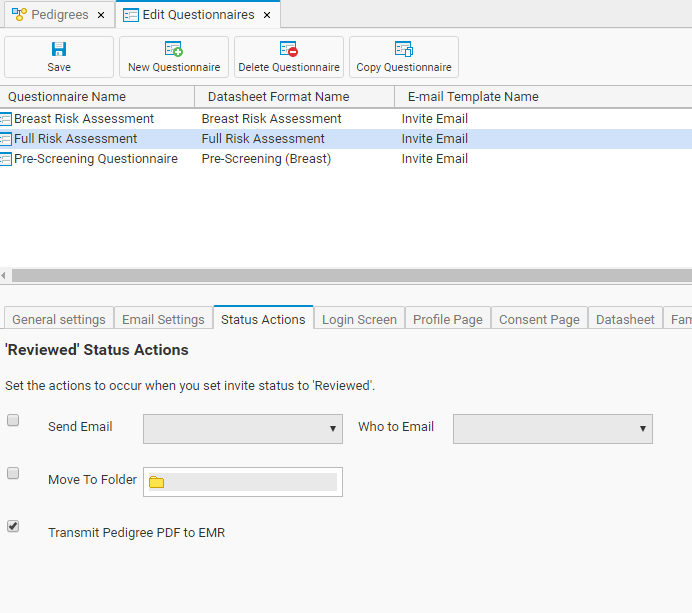 Upon setting an invitation as Reviewed in the invites module, this status action setting can also send an email to either the patient, staff (the same email address that receives questionnaire status notifications), or both. A new separate email format specific for this status action can be created in the Email Templates section and then selected here. Just like when a pedigree is moved to the completed folder after a patient submits the Family History Questionnaire when you mark an invitation has Reviewed in the invites module, this action can automatically move the pedigree to another folder. If you have Progeny and EMR integration setup and you transmit your pedigrees to your EMR, marking the invitation as Reviewed can also submit this transmit request.